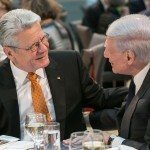 On May 14, 2014, LBI President Dr. Ronald B. Sobel presented the Leo Baeck Medal to the Federal President of Germany, Joachim Gauck. It was the first time LBI awarded its highest honor in Berlin, at a dinner to mark the opening of an LBI New York office in the German capital. 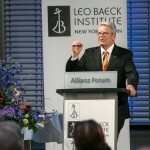 On May 14, 2014, Joachim Gauck, Federal President of Germany, accepted the Leo Baeck Medal. LBI President Dr. Ronald Sobel made the following remarks at LBI’s first Award Dinner in Berlin, held to honor Gauck. 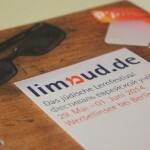 Limmud Germany held its seventh annual festival at a resort outside Berlin from May 29–June 1, 2014. About 400 participants attended workshops that spanned topics from Hebrew language, Jewish cuisine and a workshop by Dr. Frank Mecklenburg of LBI which covered the topic of German-Jewish history before 1933. 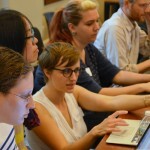 At the first public CJH Wikipedia Edit-a-thon on Saturday, May 4, 2014, about 30 volunteers, including CJH and LBI staff, members of the local NYC Wikimedia Chapter, and scholars and librarians from other institutions spent an afternoon creating and improving Wikipedia articles related to women in Jewish History. Thanks to a gift from a trust under the will of Edythe Griffinger, LBI has begun work on a project that will highlight its art collection. 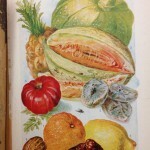 This grant will allow LBI to make the collection more accessible through the creation of a virtual art catalogue and a web portal that will allow the public to view artworks and artifacts that are rarely if ever on public display. 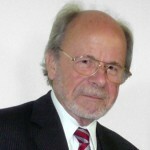 Erhard Roy Wiehn, born 1937 in Saarbrücken, is a Professor Emeritus of Sociology at the University of Constance. His “Edition Schoah und Judaica,” is one of the largest series of monographs about Jewish life in Europe and now encompasses nearly 280 books, mostly autobiographical accounts of Jewish life in Europe before, during, and after the Holocaust. We spoke to him about memory, authenticity, and obsession. He is neither a scholar nor a librarian, but Jerry Brotman knows the LBI Library Collection more intimately than anyone else. 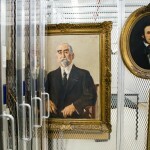 Over the past eight years, Brotman affixed barcodes to some 66,000 books, a labor as important to the functioning of a library as it is, some might say, tedious. In 2014, he claimed the singular distinction of being the only person in history to lay hands on every cataloged monograph in the Library’s 80,000-volume collection. Gaby Glueckselig came to the Leo Baeck Institute in the late 1980s as a volunteer archivist. 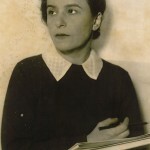 For years she helped to preserve German-Jewish culture by cataloging the Institute’s extensive photograph collection. 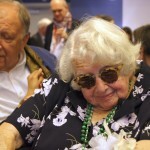 On April 27, 2014, Glueckselig returned to LBI to celebrate her 100th birthday with friends and family.